Chandler, AZ is a family friendly town. Many families have chosen it as their home because of the nice climate, the great recreational offer you can find here, and the great friends and neighbors you are meeting all the time. In fact, Chandler’s quality of life is so impressive that it continues to grow as new residents are moving to the area, year after year. But if you, a loved one or a family member are dealing with a life-limiting illness, you need a hospice or palliative care provider that understands your health care needs and the emotional needs of your family. Americare Hospice and Palliative Care is that health care provider. For years, we have been humbled and honored by the trust our patients and their family have placed in us. While our desire is to alleviate and reduce physical pain and ailments, we also place a big emphasis on the emotional and spiritual health and balance of our patients and their families. If you are in need of hospice and palliative care services in Chandler or nearby communities, contact us today to learn more about our health care and hospice services. Just like you rely on your family for care, we rely on our team of exceptional individuals in assisting us to care for our patients on a daily basis. The hospice physician is the head of our team and also visits patients at home who are in our palliative care program. Our experienced and compassionate nurses are trained to offer medical relief to manage our patients’ pain or medical symptoms. Our hospice aids ensure that the patients are clean, well-cared for and comfortable. Our team of social workers understands the emotional demands of caring for a terminally ill person and are available to assist you with their experience and knowledge. They can also assist you in sorting through legal and financial implications connected to end-of-life care. For spiritual support, you can turn to our spiritual counselor ministers, if you wish, as well as our experienced bereavement team. Our many volunteers provide invaluable companionship to patients by reading to them or just spending time with them. Did you know that over 90% of hospice care takes place in the patient’s home or a similar residential setting? Home hospice care is an important care concept that allows those with life-limiting illnesses to live every day to its full potential. Many assume hospice is a place, when in fact, it is a way of caring for those who are seriously ill or are nearing the end of their lives. We offer support and care to the entire family and primary care givers-not just the patient. Saying “yes” to hospice care does not mean being defeated by life and preparing to die. Instead it is a sign that you are making every day count and desire to get the most out of it. Hospice care makes an impact. In fact, studies show that those who receive hospice care outlive those who do not, significantly. Give your loved one and yourself the gift of hospice care. We are especially proud of our comfortable and beautiful in-patient hospice facility in Mesa, also known as “the Villa”. In this de-institutionalized environment, we care for patients with acute and critical medical issues that cannot be addressed in a home setting. While it is mainly meant for short-tern care of critical conditions, we also house patients that are facing the end of their lives. However, in-patient services are also available as respite care for up to five days to give primary care givers a much needed break. The Villa features a medically trained team for our Chandler patients, a common room, a beautiful courtyard, a chapel and more. Contact us today to learn more about our in-patient services and “The Villa”. Here at Americare Hospice and Palliative Care, we care for the entire human being. This means we alleviate physical pain and nurture the soul with spiritual counseling, companionship and compassion. Taking care of a person who is terminally ill, has to go beyond addressing medical issues and symptoms. By offering loving medical care and helping our patients to make the most of the final days of their lives, we also want to assist them in the natural process of dying. 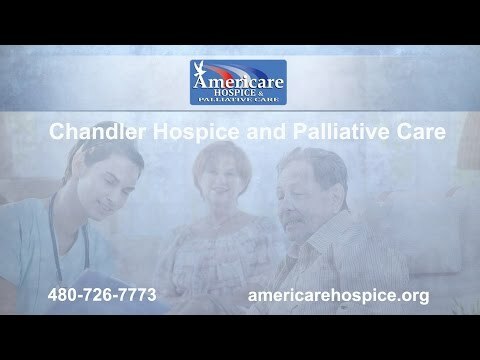 Our Chandler hospice care team provides a holistic approach to health and hospice care which is based on Judeo-Christian moral and ethical guidelines. Deciding that the time for hospice care has come can be scary, challenging, and intimidating. By not choosing hospice care you are only avoiding the inevitable. Placing a loved one in hospice care does not mean you have given up on him or her instead it shows how much you truly care for them. Don’t give up on them. By allowing hospice care to take place, you allow them to be helped medically and spiritually during the last days of their lives. 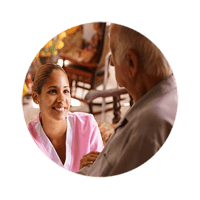 To learn more about our experienced and compassionate Chandler palliative and hospice care services contact us today. We are always here to help. Please fill out the form below or call us today at 480-726-7773. 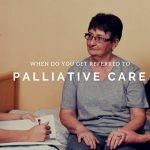 When Do You Get Referred to Palliative Care? Americare Hospice & Palliative Care is a Phoenix Diocese-approved Catholic organization dedicated to serving people of all faiths. We provide hospice care in the Phoenix metro area including Mesa, Gilbert hospice, Chandler, Queen Creek hospice care, San Tan Valley, Tempe, Scottsdale hospice care, Paradise Valley, and the surrounding areas.